Today is a day of reflection for me. 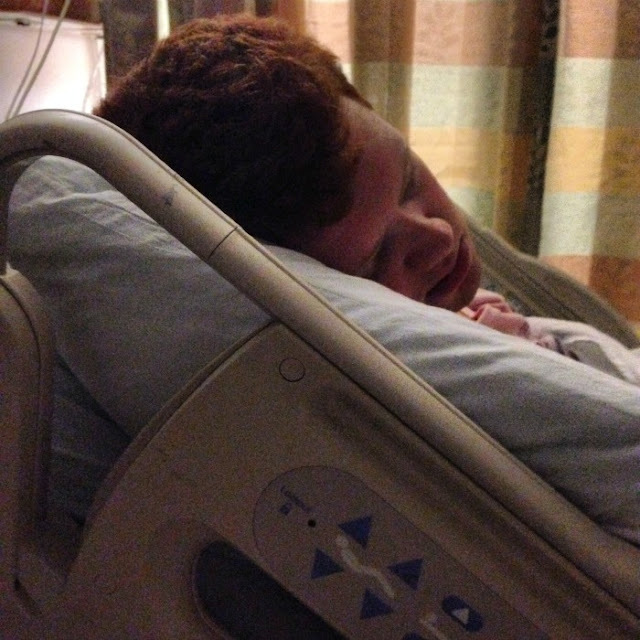 This day one year ago started out just like any other day. We were in the middle of a busy and wonderful season, with all three of our sons close to home. By the end of the day, though, I was sending out urgent prayer requests. My middle son, Preston, had suffered a stroke. Today marks a year since that desperately frightening time. As I reflect on the year that has passed, my head spins. In just the past few months, so many things have happened. 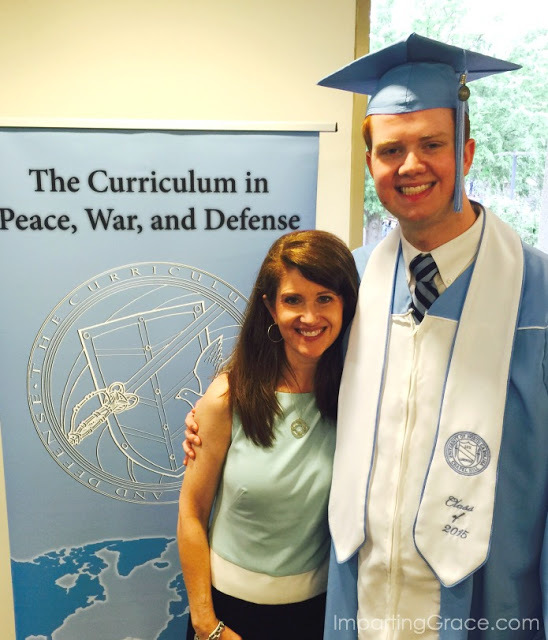 Preston graduated from the University of North Carolina at Chapel Hill and started working full-time (and he continues to do well, thank God!). 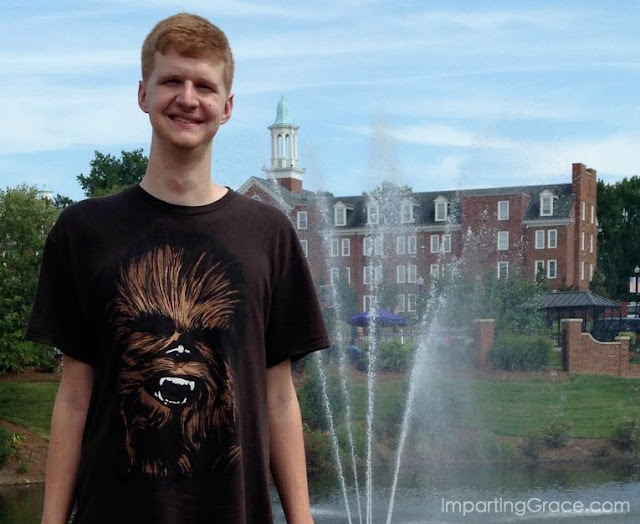 Lee, my youngest son, graduated from high school and is now in college at High Point University. And Will, my oldest son, is in Newport, Rhode Island, in U.S. Navy Officer Candidate School. I thank God that some photos of Will's class were posted on the Officer Training Command's official Facebook page. I'm pretty sure I can see my son in the group of candidates getting worked out by their Drill Instructors. Dear God, what a whirlwind. In the midst of all of that, my husband and I have become empty-nesters. What looks like a mess is a nest. An empty nest. 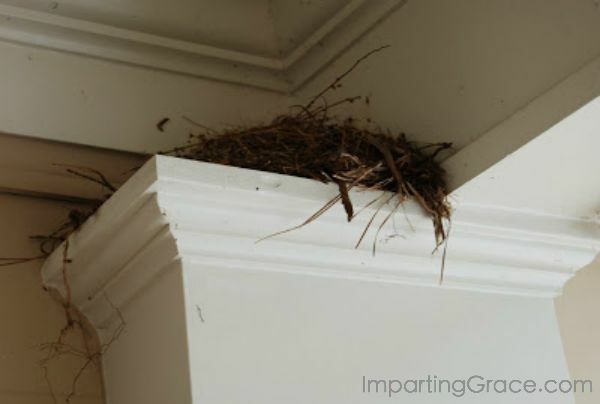 A tiny bird (a wren, I think) found the top of one of our front porch columns to be inviting and comforting. And so she chose it as a place to have her babies, to raise her family. I like to use birds' nests in my decorating. And that little wren had no use for her nest any more--her little ones had long since flown away. So why couldn't I take that nest down and put it in an arrangement or under a cloche or something? I couldn't do it. I just couldn't bring myself to disturb that empty nest. Perhaps it's because, deep in my heart, I wanted those baby birds to come back and perch there for just a bit. I knew, of course, that they couldn't live in the old nest. It was built to be a safe space for them when they were tiny and helpless. The nest didn't fit them any more. I knew this. And I was glad for those birds to be grown up and free and able to fly. I was happy for them. I felt proud of their little mama. Still, I couldn't take down that nest. Just like that mama bird, I tried very hard to build a cozy place for my little ones to grow. But, of course, there was no way for me to protect my children from all harm. Try as I might to keep them healthy and whole, I couldn't control their lives. I couldn't control the circumstances they had to face. I never did have any control. I remind myself of this truth as I think about my children, praying for their safety and well-being, missing them. I realize now why I couldn't bring myself to take down that nest. Every once in a while, I wanted those grown-up babies to fly home. And the nest would be there, waiting. It has been quite a year for you Richella and now you are an empty nester! My youngest went off to college 11 years ago and what a time of transition it turned out to be. It was very hard to let go of that sweet time of raising a family but it also began my greatest time of personal and spiritual growth and opened new opportunities for my husband and me to do ministry together. Who knows what's next for you in this new season but I know that God has some special things in mind for you. God bless you and your sweet family. Richella, this post touched my heart so deeply! How hard it must have been to see your son suffer a stroke at his young age! I am so thankful to God that he is doing well now! What a difference a year can make in our lives! The empty nest may take a little bit of adjusting, but it will be nice for you and your husband to have alone time with each other for awhile. :) And I am sure that the Lord will bring beautiful things your way as you spend time with Him in devotion, and study together. My husband and I love devotion time and we pray for all those around us that we love so much! And if you are anything like me, as a mother, you will keep busy praying for them each and every day as their lives continue to change. Someday before too long they may find wives and start families...and that will be so exciting for you when the grandkids start coming along! May God bless you greatly Richella! I have been an empty nester for a very long time now....it was so hard for me at first....Even though I only have one child, when he left for college, so did all of his friends...the house was always filled with his friends and then all of a sudden...quiet....But I think it was harder for my hubby as he coached our son since he was 4 years old along with his friends....It does get better Richella...your family will soon grow before you know it!! That was just beautiful! I'm not an empty nester yet. We have one son. He goes to university and works part time near where we live, which I am grateful for. I'll never look at an empty bird's nest the same again. I pray you experience the sweet peace that only comes from your Heavenly Father. P.S. I love your beautiful chair. The color is fabulous! I have been looking at so many shades of grey..to paint my kitchen cabinets. If you have a favorite you think would look good on cabinets? Please feel free to share the color and the brand. You have much to be thankful for in this season of life. I enjoyed your story of the bird. What a nice addition to your own story of the year you have had. Blessings. This is so beautiful and comforting! Beautiful metaphor for your experience. Sitting with you in this place of loss and transition. And also wondering what God is preparing for your next season. I'm excited to find out! Such a beautiful post. I still wish my children were home more, I always love and enjoy being with them so much. Time to adjust and that is always hard. It does take time to adjust, so allow yourself to be sad if you want to be.